The letter is anti-Semitic primarily because it seeks to draw false parallels between Nazi Germany and Israel and is sickening as the Farben factory referred to in the letter is notorious for making the gas used by the Nazis to exterminate Jews. Such demonisation and delegitimization of Israel not only fails Sharansky’s ‘3-D’ test, the comparison is also explicitly part of the European working definition of anti-Semitism and the definition used by the US State department. This sentiment was echoed by 250 Palestinian employees who applauded the CEO loudly when he gave a speech urging them to ignore the political attacks on the company and reassured them about their jobs in January 2014. Recently, the company made the decision to move their plant to the Negev and was only able to secure 130 work permits for Palestinians to work in Israel. The loss of 400 jobs was a “price the workers were prepared to pay”, according to New Zealand Palestinian Human Rights Campaign. However, according to shift manager Ali Jafar, “All the people who wanted to close [the factory] are mistaken… they didn’t take into consideration the families”. Prof Poynting’s letter to the editor is more than mistaken, it is hateful. Holocaust inversion, where Israelis are demonised as Nazis and the Palestinians are portrayed as the new Jews, has nothing to do with legitimate and necessary criticism of Israel and everything to do with a false analogy aimed at delegitimising and demonising it and its people. It is an absurd, grotesque distortion and a modern day blood libel. Israel is a thriving democracy that guarantees its citizens (including 20% Arabs, as well as people of all religions) equal rights, and operates under a rigorous rule of law. It does not commit genocide (either in terms of its intention, or the numbers); it has academic freedom and does not burn books; it does not have gas chambers; it does not aspire to imperialism but rather throughout its short history has merely sought to hold onto its tiny piece of land against attacks by its neighbours, some of which still call for its destruction. 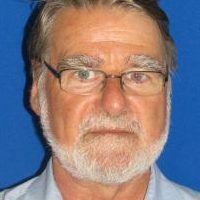 Such a comparison, that Prof Poynting perpetuates, also trivialises the Holocaust, by desecrating the memory of those who died and minimising the evil and planned mass extermination of 6 million Jews, as well as gypsies, homosexuals, dissidents and the many others who died at the Nazis’ hands. That Prof Poynting does not “have anything against the Germans” could be interpreted as him supporting the Nazis but is more likely to mean that he has everything against Jews. Here, he clearly crosses the line between legitimate criticism and hate once again. That a Professor of hate crime would write an anti-Semitic letter is bad enough. 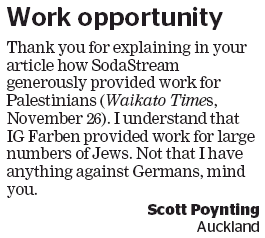 It is most concerning that the Waikato Times would publish the letter at all, regardless of who penned it. Surely editorial discretion would disallow those letters that are anti-Semitic, Islamophobic, or hateful to any particular group. Shame on them both.